I haven’t really shown much of any Renko based charts lately, but I think today is a day to review Bitcoin’s Renko chart. It’s oh so very bullish looking. Let’ recall some points about Renko charts. Renko charts are another style of chart analysis that originated in Japan. Renko charts are void of time and instead, only price is considered in the data. And more importantly, they’re a fantastic way to have a clean look and view of any instrument and/or market. One of my favorite charting styles is the Renko style. Renko is very similar to the traditional Point & Figure style of charting in that time is not a factor. There are also similarities in how Renko bricks are constructed. Renko bricks equal an amount of user defined price. On this chart, each brick represents $200 of movement. So in order for a green Renko brick to form, it has to move $200. The same goes for any red bricks. While one may assume that when Renko bricks change from red to green (or viceaversa), it amounts to only $200 of movement, that is not entirely the truth. In fact, a change in the color of a Renko brick is a significant event, especially if the change comes off of a long term trend. When Renko brick change color, we need to understand the behavior of what happened. Let’s look at the current price action on Bitconi’s Renko chart. If we notice the last formed Renko brick on the chart, we see that it turned green – the value fo the Renko brick is from $4,000 to $4,200. Now in order for that brick to form, price had to travel that full $200 move. But brick prior formed when it moved from $4000 to $3800. That means that in order to change from a red brick to a green brick, price had to move $400, so double the normal move. That is why a change in Renko bricks is important. But there is an additional piece of analysis we should observe: wicks. Not software providers allow for Renko bricks with wicks. The wick on the current green Renko brick tells us how far price moved, but was unable to paint a new red brick. This green Renko brick is telling us that price moved as low as $3638 before moving all the way up to $4200, or +$562. 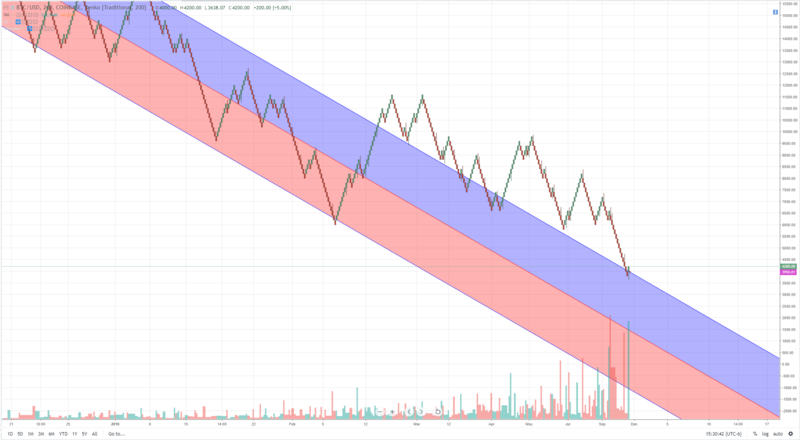 The red and blue channel on the screen represents a linear regression channel that begins at the all time high of 19800 to the swing low of 6000. There have been a number of attempts to push Bitcoin higher and to trade in a new trend. What we do observe is that while prices have continue to fall, there is some bullish structure that exists within this channel and that is significant support being found on the upper channel line. There is a strong combination of bullish indicators here with price finding support against the upper linear regression channel and, perhaps more importantly, the formation of a new green Renko brick (with a long wick) right off of that channel. If we include the amount of volume that has poured in over the past month, we could see a strong reversal here.